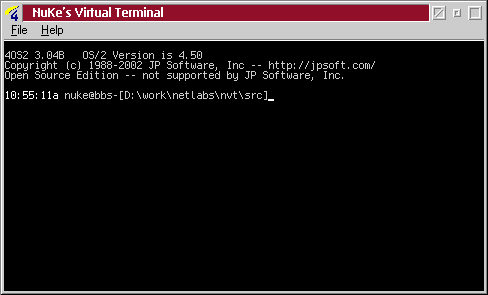 Nuke's Virtual Terminal is a free VT220 emulator for OS/2 PM and console. The idea is that you open NVT instead of an OS/2 Window and you have all the features of an OS/2 Window except it also supports VT220 instead of plain ANSI, is resizable on the fly as well as having some nice PM features. This is ideal for porting Unix applications to OS/2. Normally many applications that require VT220 features to function on OS/2 must be patched to use VIO equivalents. If using NVT you no longer need to patch the Unix source code for these applications to function. This application is not fully functional and is currently in a state of limbo. Several people have contacted me about continuing work on it but I have not seen any results yet. The source code is in Netlabs CVS. Here is a screenshot of NVT in action.